Remember me? I used to write this blog way back when. It has been a crazy few months for me with having our house up for sale. Lots of cleaning, organizing, purging, cleaning, and more cleaning. We've had 30+ showings, which were always a half-day ordeal with two of my four boys following me around un-making the beds and dumping out the toys I'd just put away. We painted rooms that needed painting, touched up trim that was scuffed, got the carpets cleaned, replaced the kitchen sink and two bathroom sinks, and bought new appliances. Then we decided this was a pretty nice house and we didn't really want to sell it. No, really, we're not. We took it off the market yesterday, and may try again in the future if God opens that door, but for now it just doesn't seem like the right time. I was a little bummed at first, but I know that everything is happening just like it's supposed to. Plus, pretending you're moving is like January organizing on crack, and I got to turn down two showings today which means that I'm blogging instead of cleaning. So Happy Friday to YOU. I love Bare Minerals makeup. That stuff lasts forever. I was at the Macy's makeup counter a while back and the lady mentioned that you are supposed to replace your makeup like every six months. "Six months?" I said, "Soooo..... I should get rid of the eyeshadow I've had since 2000? But it's still half full." I'm pretty sure she thought I was kidding. Luckily, fate took the decision out of my hands recently when Mr. B played beauty parlor in my bathroom. In my head I'm totally doing Project Life this year. I just haven't started it yet. I got my children on board with the whole moving thing by telling them that when we move to the country we can have a pet. Rowan: "Mom, when are we going to move? If we don't hurry all the guinea pigs at the pet store might be dead." When I was in second grade, I heard a Dolly Parton tape for the first time and decided she was the best singer there ever was. NKOTB, Janet Jackson, and Paula Abdul were nothing to me. I was a Dolly Parton fan through and through. Recently I found out that the #1 was song on the day I was born was "9 to 5" by Dolly Parton. At Christmas time I learned an important lesson. You can try to control the sugar-cookie-decorating results by only offering boys innocent shapes such as hearts, stars, and gingerbread men. However, boys will be boys. And sometimes gingerbread men get their arms cut off and bleed out. If any of you are still out there who want to 'fess up with me, please come link up! I hope things have settled down and we get to hear from you a bit more when you have time. I don't know how I missed this, but I was looking for a post from you last week and did not see this one in my reader somehow. My apologies. I need a really good powder. I have terrible skin. I need one with really good coverage. So, if you know of such a powder, you should be a dear and fill me in. I think it is great that your enjoying your house again. God has something great in mind for you! Hey girly... I've been a slacker blogger lately too. But I feel ya' on the crazy life front - it has been busy lately. I think we have our priorities in order if we are spending more time with the family and making sure we are loving them well. There are seasons when I am able to juggle a bit more, and then there are seasons/weeks/days when I can't. And, I just have to be cool with that. 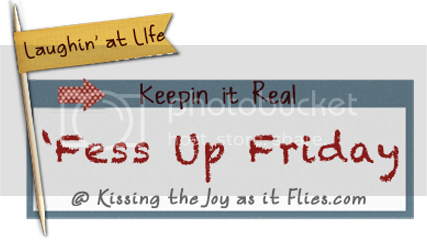 I did actually post a 'fess up Friday for the first time in a while... You know I am challenged with the whole bloggy world, but I didn't see the linky button thingy, so I couldn't link up with you, but I thought of you and wanted to let you know that I am still your 'fess up sista'.